This paper is translated from "La mort annoncée du Traité FNI et la fin de l’après-Guerre froide", Note n° 02/2019, published on February 1, and slightly updated to take into account the Russian suspension annoucement. The announcement of the US withdrawal from the Intermediate-Range Nuclear Forces (INF) Treaty is not a surprise, since Washington had warned of such an announcement on October 20, unless, in the meantime, Russia complied with its obligations. A countdown has now begun: the United States has suspended its obligations under the Treaty and unless unexpected developments occur, the US withdrawal will become effective in early August. The somewhat baroque nature of the situation is clear to all: the United States withdraws from a treaty it complies with, Russia remains in it - to the letter - while violating it. How did it come to this? And what are the foreseeable consequences of this new situation? A symbol of the end of the Cold War, the INF Treaty was the product of its time. Its disappearance in practice is also the product of a new context: Russian policy of increasing military power in defiance of Moscow's commitments; a detestation in the White House of some treaties perceived as shackles; but also a radical transformation of the strategic landscape (in Asia). For Europe, the issue of intermediate-range missiles is no longer as central as it was thirty or forty years ago. But the end of the INF Treaty is not without consequences for Europe. on NATO’s side, a desire to be able to have the means to strike with certainty the Russian territory with so-called non-strategic capabilities (based in Europe) in order to avoid transatlantic “decoupling”, particularly in view of the new Soviet capabilities (the multiple-warhead SS 20, more accurate than their predecessors, deployed from 1976 onwards). The “dual-track decision” of 1979 was a diplomatic optimum: NATO responded to an identified doctrinal need - particularly on German pressure - while giving arms control a chance. The “zero option” proposed by Ronald Reagan in 1981 was also clever: in keeping with the president's personal preferences, it placed the ball in Moscow's court. At the time, few Western leaders imagined it would be feasible, and the first Pershing II and Gryphon were deployed in 1983. Then came the Gorbachev surprise, and his willingness to change the rules of the game against the advice of a large part of the Soviet military establishment (even though the Pershing II constituted a real threat to the country's command and control system). Not to mention the shock - often underappreciated - of the Chernobyl disaster on the Kremlin and its perception of nuclear risks. In the second half of the 1980s, there was a convergence of interests between the personal political preferences of Mr Reagan and Mr Gorbachev and European public opinion for a complete elimination solution, against the advice of most of the continent's political leaders (Mr Kohl, Mrs Thatcher), but with the support of the Japanese government, which did not want a solution of withdrawal beyond the Urals and would contribute to imposing total elimination in 1986. It was not until 1987 that Bonn complied, but on the condition that 500-1000 km missiles (Pershing I, SS 12, SS 23) were also eliminated. As the first nuclear disarmament treaty (elimination of delivery systems), the Treaty was accompanied by intrusive verification procedures - made possible by the cooperative atmosphere of the time. By 1991, 846 US and 1,846 Soviet missiles had been destroyed, with Ukraine, Belarus and Kazakhstan becoming parties to the Treaty after the end of the Soviet Union. It was very shortly after the end (2002) of the verified elimination process of the missiles concerned and the meetings of the Special Verification Commission (2003) that Moscow apparently began to develop a new family of ground-to-ground cruise missiles. The culprit, the 9M729 launcher (NATO: SSC 8), appears to have a maximum range well beyond the ceiling (500 kilometres) of the INF Treaty. It is part of a policy of “letting loose” Russian design offices and manufacturers in order to preserve the industrial complex and then recapitalize the armed forces, and in particular to develop all-round long-range dual-capacity (conventional and nuclear) strike capabilities. These include surface-to-surface missiles, in line with the traditional preference of Russian military culture (and also for cost reasons). It is intended to respond to the perception of the potential threat posed by the proliferation of surface-to-surface missiles on Russia's eastern (China...) and southern (Iran...) flanks. This explains why Moscow once raised with Washington the possibility of a joint withdrawal - in the absence of a hypothetical multilateralization floated by the Kremlin, in conjunction with the United States, as early as 2007-2008. It also constitutes, to a certain extent, a form of revenge of the military establishment (upon which the elimination of the Euromissiles had been imposed) and of the political leadership against Mr. Gorbachev's line (assimilated to weakness vis-à-vis the West). 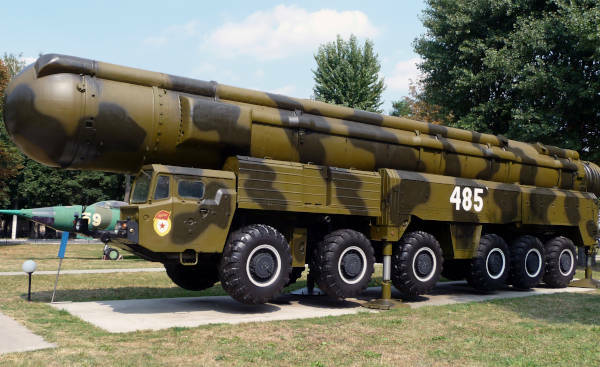 Using the Iskander-K family's Transporter-Erector-Launcher (TEL), the 9M729 is part of the new generation of dual-capacity surface-to-surface assets (including the Iskander-M launcher, sometimes suspected of exceeding the 500-kilometre range, which was intended to partially compensate for the loss of the SS 23 eliminated under the INF Treaty). The 9M729 has been deployed since 2016 on at least two bases east of the Urals Mountains and near the Caspian Sea (to date, four battalions of four TELs each according to US declarations). This is not an overt violation - which would have sparked public debate and put the Russians in a defensive position - but rather a discreet one. It was detected mainly from the study of the tests carried out (test from a fixed launcher over 500 kilometres and from a mobile launcher below this ceiling) as well as images of the weapons system. Russia is also suspected of violating the Treaty in the ballistic field both “from below” (the SS 26 surface-to-surface short-range missile, beyond 500 kilometres) and “from above” (the RS 26 long-range surface-to-surface missile, below 5,500 kilometres). Informed by the Obama administration about the issue since 2013, a year before making public its formal assessment of the violation (Congress had been informed as early as 2011), Europeans were rather sceptical at first. In 2019, the doubt was dispelled and it is possible to say that the conclusions of several European intelligence services independently validate the American judgment with a fairly high degree of probability. Russia's diplomatic position has evolved: after first denying the existence of a new missile, Moscow finally admitted its existence, but argued that the SSC 8 was in conformity with the INF Treaty (a position it can publicly hold in the absence of a test of more than 500 kilometres from a mobile launcher). In January 2019, it presented its arguments in detail to the international press: it claimed that the missile has a range of 480 kilometers. The differences with its immediate predecessor, the 9M728 (SSC 7), would, according to the Russian presentation, be minimal: the container of the new missile would be 53 centimetres longer, but its range would allegedly be... shorter by 10 kilometres (480 instead of 490), the load it carries being more important. But if the container was shown... the missile was not, which makes it impossible to make a more advanced assessment from open sources alone. By installing Mk 41 (Aegis Ashore) anti-missile launch facilities in Romania and (soon) Poland, which could be used as cruise missile launchers (which is technically true but would require a modification of the software and wiring, not to mention a change in the bilateral stationing agreement). By using targets (missiles) prohibited by the Treaty for its anti-missile interceptor tests (which Washington disputes). By deploying long-range armed drones (which do not fall into the traditional category of "cruise missiles"). Naturally, the American side can easily retort that a violation and a possible divergence of interpretation of the terms of the treaty, or even of its spirit, cannot be equated. The possibility of a settlement of the dispute between the two parties is excluded in the short term. Russia seems to have decided to multiply the dubious arguments to establish a parallel between its attitude and that of Washington. Admittedly, the existence of an obsidional complex in Russian politico-military circles should not be overlooked: their opposition is not only the result of discontent with the fact that countries of the former Warsaw Pact are becoming even more deeply embedded in the transatlantic defence system. But even supposing that the question of Mk 41 sites could be the key to resolution of the dispute - which is a matter of debate - it is difficult to imagine that a visit by Russian inspectors to these sites could reassure Moscow, insofar as the uselessness of these sites for offensive launches cannot be demonstrated in a visible and easily convincing way (since it concerns the nature of software, electronics, etc.). While a phased exit strategy had been planned through an inter-agency process, Mr. Trump surprised even some of his closest advisers by suddenly announcing, on October 20, 2018, the upcoming withdrawal from the treaty, even as Mr. Bolton was scheduled to fly to Moscow the next day to give notice to his Russian interlocutors. This announcement revealed the intrinsically ideological nature of a decision consistent with the detestation of treaties perceived as “shackles” by a large part of the Republican camp, now embodied at the top of the state. However, there was a fundamental strategic motivation for this withdrawal, shared in Washington well beyond the first circle of the White House. For several years, the Pentagon has been concerned about the imbalance, according to it, between Chinese and North Korean ballistic and cruise missiles and American resources in the region. According to Washington, 95% of the approximately 2,000 Chinese missiles (DF 4, DF 15, DF 16, DF 21, DF 26, HN 1, HN 2, CJ 10, CJ 20...) are of the “INF” type, most of which are part of anti-access or coercive strategies (Taiwan). Consequently, like the ABM Treaty at the time (cf. the 2002 withdrawal), the INF Treaty appeared to be a constraint preventing America from acquiring the means of defence adapted to the changing context. Under the leadership of Senator Tom Cotton, Congress demanded and obtained at the end of 2017 the initiation of a research and development programme for a mobile surface-to-surface ballistic missile. As part of the Nuclear Posture Review (NPR, 2018), the Administration had sought to counter this initiative with a new nuclear-capable sea-launched cruise missile program. Not without recalling, in a way, the spirit of the 1979 double decision, it was both to meet a strategic need (extended deterrence in Asia) and to give a chance, optically at least, to a return to Russian compliance with the Treaty. Freed from the INF Treaty, the United States will consider additional options. It is doubtful that they will embark on an entirely new surface-to-surface ballistic missile program, but the US Army will probably want to use the end of the Treaty to determine the characteristics of its future Long Range Precision Fires Missile. For long ranges, the most likely choice is a surface-to-surface, non-nuclear version of the same new sea-launched cruise missile. Initially skeptical, Europeans then often appeared stunned by the prospect of a “new Euromissiles crisis”, even if the public resonance of the issue is very different from what it was in the 1980s. Today, they remain essentially spectators, even though, in 2018, Washington obtained NATO's open support for its position. This support, whose late nature was justifiable from a European point of view (in view of the need for detailed national assessments of the issue), caused a certain bitterness in American strategic circles, where it is fashionable to believe that stronger and more visible Western pressure could have forced Moscow to back down. At most, the Europeans were able to push Washington to adopt a grace period of a few months, which thus expired on 2 February. Fundamentally, however, the INF crisis is not a central strategic issue for Europe today. The new Russian missile was probably not developed first and foremost with a view to changing the terms of the continent's strategic equation. Europe, moreover, has long been facing new-generation dual-capacity Russian surface-to-surface missiles (Iskander-M short-range ballistic missile), sea-to-ground (SS N 27, SS N 30 cruise missiles) and air-to-ground (KH 101, KH 102 cruise missiles). Only in the case of a massive and conspicuous (announced or detectable) nuclearisation of these new capabilities would Europe face a new strategic problem. For Europeans, the first consequence is political: the INF Treaty symbolises the end of the Cold War. The American withdrawal may lead them to put the White House - which, in terms of public relations, shot itself in the foot in October 2018 - and the Kremlin - which now has the right role from this point of view - on an equal footing. The consequences for transatlantic relations are therefore not positive. And now, what? Russia could have capitalized on the US political fault and said it would remain bound by the INF Treaty. This is what had been suggested by Mr. Putin in December 2018. But Moscow has made a different choice: while publicly blaming the United States, it has mirrored US strategy by announcing it was suspending its obligations – though while stating that it would not “deploy” missiles of that range if Washington refrains from doing so. But further deployments of 9M729s are likely to follow in any case, since Moscow it claims it does not violate the Treaty. In addition, Russia could be tempted in the coming years to develop a new version of the SS 26 ground-to-ground missile (whose maximum range is currently estimated at 700 kilometres, i.e. beyond the threshold of the INF Treaty), transforming it into an “intermediate range” category missile. Releasing the constraints of the INF Treaty would generally allow the development and deployment of multiple types of thrusters to address objectives in the 500-5,500 kilometre range, broadening both the range of objectives and possible deployment areas. Should Russian deployments be countered by with new permanent Western deployments (conventional or dual capacity)? And if so, for what purpose: to counter Russian capabilities, or to hope (again in the spirit, mutatis mutandis, of the 1979 decision) for a resumption of the arms control process? Should NATO's missile defense architecture be modified, in particular to counter the threat of cruise missiles (e. g. by integrating SM 6 interceptors) or even certain categories of Russian ballistic missiles? Such orientations, which would not go without controversy, would consolidate NATO's defence posture, with the consequence of further integrating the host countries into the American military sphere, a result that is undoubtedly undesirable for the Kremlin and a now well-known dynamic (counter-productive effects for Russia of Moscow’s strategy, unless one thinks that the radicalisation of the opposition between two blocs is the desired goal). But they could also be presented by Washington as a tangible reinforcement of American protection towards a continent that doubts its sustainability. All this at a very substantial financial cost, which would inevitably raise the question of the role of nuclear deterrence in NATO's strategy: some actors might be tempted to enhance it in the face of the new threat of Russian conventional missiles; others, on the other hand, would find their traditional reflexes of opposition to any upgrading of Western nuclear capabilities (see SPD's reluctance to see Germany's nuclear role become sustainable). The perspective is different for Asia. In the United States, concerns about the development of Chinese and North Korean ballistic missile and cruise missile arsenals are bipartisan. However, it is unlikely that a Democratic administration would have withdrawn from the INF Treaty just in order to have a free hand in Asia. Wishing to capitalize quickly on the withdrawal from the Treaty, the Trump Administration will undoubtedly make known in the coming months its guidelines for strengthening the defence of East Asia. In addition to the reintroduction of a nuclear sea-launched cruise capability (a NPR decision, not contrary to the INF Treaty), it will decide on the merits of deploying new conventional missiles in the region. As such, the “surface-to-surface” option is put forward by observers for cost reasons. However, while parking mobile surface-to-surface cruise missiles in Guam would be possible for long-range assets (distance from the continent: about 3,000 kilometers), it would require the agreement of host countries elsewhere. In Japan, without excluding this possibility, it is considered that it would probably be difficult to obtain the public's consent to “offensive” US missile deployments, even in sparsely populated areas (Hokkaido Island). Similarly, South Korea and the Philippines would probably be unlikely to be receptive. For China (and probably North Korea), the withdrawal of the INF treaty validates the narrative according to which America is seeking military superiority in the region and does not accept the country's rise to power. It remains to be seen how these countries will react to a possible multiplication of offensive systems in their immediate environment - especially if Russia were also to be involved. The conclusion of the INF Treaty had been a major event from a dual point of view: it marked the end of the Cold War in terms of strategic relations; and it meant that disarmament (and no longer only arms control) was possible, by initiating unprecedented verification procedures. It thus marked the beginning of the decline in the American and Soviet nuclear arsenals, which had peaked in 1986. The de facto disappearance of the Treaty marks the end of the post-Cold War strategic relationships: it symbolizes and reveals both the evolution of the international context (Asia's rise to power), the disinterest, for different reasons, of Russia and the United States in binding nuclear arms control regimes, and of course the deterioration of relations between the major nuclear powers. The American withdrawal is obviously a new nail stuck in the coffin of disarmament. The conclusion of the Treaty had indeed contributed to creating a climate of trust allowing the negotiations on the START Treaty (whereas SALT II had not been ratified by the Senate). However, all indications are that Moscow and Washington are not ready today to consider a new strategic nuclear arms control agreement - not to mention that the Senate would certainly refuse to ratify such an agreement as long as Russia violates the INF Treaty. And it is not even certain that the two countries will agree to extend the current treaty, New START, beyond 2021. If this were the case, it can be said that almost the entire arms control building would have disappeared - and responsibility for it would lie with both sides. Only pressure from Congress (with a Democrat-majority House of Representatives), which could demand an extension of New START in exchange for funding to recapitalize the US arsenal ($494 billion for the period 2019-2028, according to the latest estimates of the Congressional Budget Office!) could change the situation, provided that Moscow wants to play the game. Arms control and disarmament treaties applying to nuclear weapon delivery systems should not be idealized, and talking about a “new arms race” that would be automatically triggered by their abandonment is a matter of ease of language but also of intellectual laziness. If the dynamics of action/reaction exist today - as has always been the case - the balance of power between the major nuclear powers is in no way reflected in an unbridled quantitative race for superiority. Nevertheless, such treaties have at least one undeniable virtue: they improve the mutual knowledge of the arsenals of both parties, and give a certain predictability to their evolution. If China had the slightest desire to consider, at some point in the future, discussing strategic arms control with the United States, this scenario may no longer have any credibility. The idea of a new agreement with Iran, which would be more binding than or complementary to the 2015 Joint Comprehensive Plan of Action (JCPOA), is falling through the cracks. How can we believe that Tehran could trust Mr. Trump's word? This is just as true for North Korea. It was probably necessary to be very naive to believe that a real denuclearization agreement could be concluded with Pyongyang. But after the withdrawal of the JCPOA and the INF Treaty, Kim Jong-un will probably learn the lesson that against the United States, it is important to remain well armed. This is not 1979. The issue of the INF Treaty must be seen in a global perspective, with the maturation of Asian and Middle Eastern arsenals largely explaining the current situation. The 1987 strategic solution became, from both Moscow and Washington's perspectives, a strategic problem in 2019. Moreover, the nuclear issue itself is no longer at the heart of the debate: it is the conventional attack and defence capabilities that are (even if these forces are dual-capable). The “return to normalcy” is excluded. The United States has not completely abandoned the idea of bringing Russia back in the fold. But it is difficult to imagine the scenarios in which they would succeed: a possible “inspection” of the Aegis Ashore sites would not be sufficient (any more than Washington's commitment of missile programs outside the parameters of the INF Treaty); and possible new US deployments would not lead to a return to the Treaty, as long as they were intended to meet a new need (Asia). A "new treaty" is inconceivable today. The idea of multilateralization (or rather globalization, since the INF Treaty is already legally multilateral) has no chance of interest to Asian and Middle Eastern countries. At most, in the medium term, a new bilateral treaty banning only intermediate-range ballistic missiles can be envisaged - which Washington and Moscow free to deploy cruise missiles in Europe and Asia. Moscow and the US Congress will determine the next steps. The keys to future scenarios are mainly in Moscow (what strategic choices after the American withdrawal?) and in the US Congress (what funding for new programs and under what conditions?). At first, Europeans will remain largely spectators. But they will soon have to decide in the future on options concerning the continent's security and defense: a deployment of conventional long-range missiles on the continent? An extension of NATO's missile defense program to take into account cruise or even Russian ballistic missiles? Deployments of new cruise missiles will increase. In all scenario, the trend is towards a proliferation of Russian dual-capable surface-to-surface cruise missiles on Russian territory, and US nuclear sea-launched cruise missiles intended to protect East Asia and even Europe.